Dayton HamventionÂ® 2014 Honors "Makers -- the Future of Amateur Radio"
The ARRL has launched a new online resource that allows users to take randomly generated practice exams using questions from the actual examination question pool. 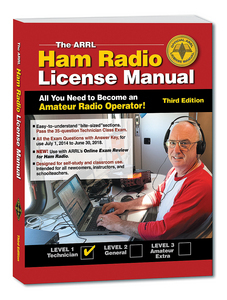 ARRL Exam Review for Ham Radioâ¢ is free, and users do not need to be ARRL members. The only requirement is that users must first set up a site login (this is a different and separate login from your ARRL website user registration). "The ARRL's online Exam Review is designed to help license examination candidates review their progress as they study," said ARRL Marketing Manager Bob Inderbitzen, NQ1R. "As you complete a chapter or section of a license manual, you can turn to the online program to review all of the related questions taken directly from the examination question pool. After answering each question -- right or wrong -- the correct answer is shown, and a page reference to the license manual is displayed for further review." Inderbitzen said that when you're close to completing your study, you can take as many practice exams as you like. "The practice exams can be taken on-screen or printed. You won't have any surprises on exam day!" he added. Inderbitzen said users are encouraged to share feedback and suggestions for improvement with the development team, using the online feedback form linked from the Exam Review site. ARRL Exam Review was designed for ARRL by DHF Systems, the creator of ARRL's TravelPlus for Repeatersâ¢ software. Education Services Manager Debra Johnson, K1DMJ, pointed out some of ARRL Exam Review features that are intended to help Amateur Radio instructors and schoolteachers. "Instructors have a new online resource at their fingertips," she said. "They can print practice exams anytime and encourage students to review between classes. The site is also mobile-browser friendly, so it can be used on a laptop, tablet, or smartphone, at home or in the classroom." 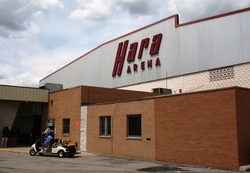 Focusing on a renaissance of the time-honored tradition of experimentation and equipment building in Amateur Radio, Dayton Hamvention 2014, gets underway on Friday, May 16, at the venerable Hara Arena, its home since 1964. Its theme this year is "Makers -- the Future of Amateur Radio." Some 24,500 people attended the 2013 event, which has been sponsored from the start by the Dayton Amateur Radio Association (DARA). Hamvention 2014 General Chairman Charles Kaiser, KD8JZR, said what some call "a maker renaissance" derives from a renewed desire to build things, and that radio amateurs "are all 'makers' at heart." "Indeed, the current maker movement encompasses a broad swath of ideals and activities [that] Amateur radio operators have been using for decades: Building projects, repurposing old [ones], learning new skills, techniques, and solving problems," Kaiser said in his welcoming remarks. "Making things makes you a critical thinker, a problem solver. Dayton Hamvention is a Regional ARRL Centennial Event, and, in fact, the 100th anniversary of the League's founding falls on Sunday, May 18 -- the final day Hamvention 2014. ARRL President Kay Craigie, N3KN, and Chief Executive Officer David Sumner, K1ZZ, will host a party that morning, complete with a cake, to wish the League a happy 100th birthday. Throughout Hamvention, W100AW/8 will be on the air as a special event station. The ARRL will be marking its Centennial throughout Hamvention weekend as well. 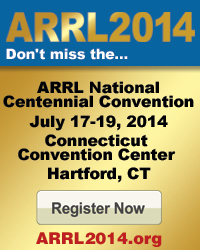 It's a good time to learn more about the ARRL National Centennial Convention, July 17-19 in Hartford, Connecticut. Nearly 500 indoor exhibitors and more than 2000 outdoor exhibitors are showcasing the latest Amateur Radio equipment and technology as well as providing a marketplace for buying, selling, and trading all manner of used and vintage gear, components, and accessories. The Hamvention 2014 forum program features familiar faces as well as several first-time presenters, who will cover topics ranging from FCC regulatory matters to contesting, emergency and public service communication, antennas, digital technology, and DXing. New this year on the Hamvention website is live video coverage (via USTREAM) of the activities at Hamvention. 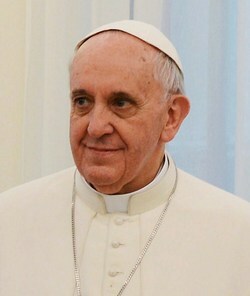 Other organizations and individuals have provided streaming video in the past, and this year is expected to be no exception. The headquarters of the League's Hamvention presence will be ARRL EXPO in the Ballarena, which features all phases of the League's endeavors, including the Youth Lounge and activities for younger visitors, DXCC card checking, and more. In addition to the annual ARRL member forum, the League will host technical forums on antenna modeling and impedance matching as well as two presentations of the centennial video "ARRL at 100 -- A Century of Ham Radio." This year's event marks the 62nd Hamvention. The gathering began modestly in 1952 as the Southwestern Ohio Ham-Vention in downtown Dayton. Today it's the largest Amateur Radio event of its type anywhere, with visitors from around the world gathering to socialize, to learn, buy, sell, dicker, or attend one of the various activities held in conjunction with Hamvention. Hamvention 2014 will include a "no-fly zone" in the airspace above the Hara Arena complex for the duration of Hamvention, for any type of remote-controlled model aircraft. The prohibition was instituted, Hamvention said, in the interest of visitor safety. Firearms also are prohibited at Hamvention. Dayton Hamvention 2014 Amateur of the Year Larry Price, W4RA. Hamvention 2014 will honor award recipients at the Sunday afternoon closing ceremonies. 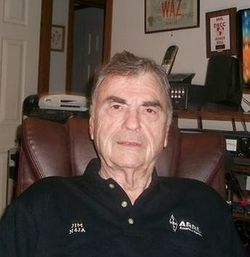 Hamvention 2014 Amateur of the Year is Larry Price, W4RA, who served from 1984 to 1992 as ARRL President and later as IARU President. The League's CEO, David Sumner, K1ZZ, will receive the Special Achievement Award. Also honored will be Technical Excellence Award winner David Freese Jr, W1HKJ, for his work with digital communication modes, and the Club of the Year, the Gwinnett Amateur Radio Society (W4GR) for its efforts in furthering ham radio in the Atlanta area. Two major American Amateur Radio manufacturers are joining forces. Alpha Amplifiers and TEN-TEC have announced that they will merge under the RF Concepts brand. The announcement came May 9 in Longmont, Colorado, where RF Concepts and Alpha are headquartered. TEN-TEC, the older of the two concerns, is located in Sevierville, Tennessee. The merger creates a multi-million-dollar company with a product line that extends from QRP transceivers to legal-limit amplifiers. RF Concepts/Alpha Amplifiers has been in business since the early 1970s and has produced more than 13,000 amps. TEN-TEC, founded in 1968 as a maker of transceivers for the QRP community, has expanded its line over the years to include a range of transceivers -- from basic to top-tier -- receivers, tuners, amplifiers, and accessories. While there is a small overlap in the companies' respective product lines, RF Concepts Chairman Michael Seedman, AA6DY, called the union "the perfect combination of Amateur Radio brands." "For more than 40 years, Alpha Amplifiers and TEN-TEC have shared a reputation in the Amateur Radio market for offering exceptionally well-engineered, American-made products backed by extraordinary customer service," said Seedman. "Alpha Amplifiers is known for 'key-down performance,' and TEN-TEC is known for pushing the boundaries of transceiver performance and capabilities." Such a merger "makes perfect sense," he added, pointing out that the merger will more than double the size of RF Concepts, allowing it "to invest more capital in innovative engineering and customer-driven product development." Plans call for RF Concepts to share operations between its Colorado and Tennessee locations, and the company is looking for a new operations facility in the Sevierville area that would house manufacturing as well as some engineering resources as well as technical and customer support services. TEN-TEN had announced that it would not be holding its annual hamfest in Tennessee this year, due to plans to relocate its headquarters this fall. TEN-TEC announced "a massive moving sale" during September. The Colorado facility will house engineering resources, technical and customer support services, and much of the front-office operation. Announcement of the merger came a week before Dayton HamventionÂ®, where both Alpha and TEN-TEC will continue to operate separate booths. Alpha will be demonstrating its not-yet-released DreamTuner 4040 Automatic Antenna Tuner, while TEN-TEC will unveil the Patriot, an open-source, Arduino-based SSB transceiver. The two companies are privately held, and terms of the merger were not disclosed. Read more. The FCC has dismissed without prejudice a Petition for Rule Making (RM-11651) by Lockheed Martin that would have amended the Commission's Part 15 rules to expand deployment of the company's radio frequency identification (RFID) system in the 433 MHz band (433.5-434.5 MHz). Lockheed Martin sold its RFID business 2 years ago, but the company only this month requested that the Petition be withdrawn and the proceeding terminated. The ARRL had staunchly opposed the Lockheed Martin petition, which the firm filed on behalf of its subsidiary, Savi Technology. The League locked horns with Savi years ago, when the company successfully petitioned the FCC to amend, in 2004, its Part 15 rules governing periodic radiators to permit high-power, near-continuous duty RFID tags in the 433 MHz band. As a concession to opponents, the FCC limited deployment of the devices to "commercial and industrial areas" and allowed their use only for tracking "commercial shipping containers." Lockheed Martin acquired Savi Techologies in 2006. The now-dismissed petition would have expanded the frequency range of the RFID tags to 433.05-434.79 MHz, required listen-before-transmit protocols to avoid interference to Amateur Radio, eliminated a manufacturer registration requirement, and dropped rules that prohibited deploying the devices outside "commercial or industrial areas" and limited their application to "commercial shipping containers." The ARRL filed vigorous opposition to the Lockheed Martin Petition in January 2012, saying that Lockheed's petition "seeks to undo virtually all of the few interference protections" the FCC had adopted in 2004, "solely on the basis of vaguely stated advances in RFID technology." Other Part 15 device manufacturers also opposed any expansion of the high-power application. A May 14 Commission letter from FCC Office of Engineering and Technology Chief Julius P. Knapp said that on the basis of Lockheed Martin's Petition and the comments filed on it, "we do not find sufficient basis to propose rules," and determined that the original petition "does not warrant" FCC consideration. Knapp added, however, "Any party interested in pursuing changes to the rules for RFID operations in the 433 MHz band may file a new petition." Three International Space Station crew members returned to Earth May 13 after 188 days in space. The NASA reported that the Expedition 39 crew members, Cosmonaut Mikhail Tyurin, RZ3FT, of Russia, and Astronauts Koichi Wakata, KC5ZTA, of Japan, and Rick Mastracchio, KC5ZTE, of the US, all appeared to be in good condition. 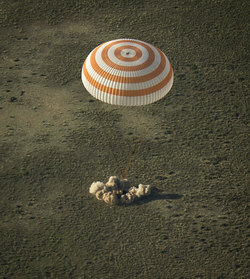 Their Soyuz TMA-11M spacecraft landed in the steppe of Kazakhstan, borne by parachute for the final part of its descent. Helicopters carrying Russian recovery teams and NASA personnel reached the landing site shortly afterward to assist the crew and to conduct medical examinations. Swanson and his crewmates, Alexander Skvortsov and Oleg Artemyev of Roscosmos, will operate the station as a three-person crew for 2 weeks until the scheduled arrival of three new crew members -- Reid Wiseman, KF5LKT, of NASA, Max Suraev of Russia, and Alexander Gerst, KF5ONO, of the European Space Agency. Although the trio is scheduled to launch to the station from Kazakhstan on May 28, increasing political tensions between Russia and the US stemming from the situation in Ukraine have cast doubts on Russia's willingness to continue to ferry US crew members to the ISS. On the day of Expedition 39's return, Russia announced that it would deny US astronauts transportation to the station. Russia said its action was in response to US-imposed sanctions on Russia. Since the space shuttle program ended, the US has depended on Russian space vehicles to carry its astronauts into orbit. WRTC-2014 has announced the various awards available to stations working the WRTC teams during the competition this July. The WRTC-2014 Chase" will run concurrently with the IARU HF Championship, which gets underway from the Boston area on July 12 at 1200 UTC. The 59 competing stations will sport distinctive call signs -- not yet announced -- that will be easy to recognize. "The WRTC teams will be using 100 W to simple antennas," Andy Blank, N2NT, director of the WRTC-2014 Competition Committee said in stressing the importance of off-site participants as part of the competition. "High activity will make the competition more exciting and help identify the more-skilled operating teams. In what other sport can you stay home and still be on the field of play?" WRTC-2014 is encouraging "everyone" to work the competing teams on as many bands and modes as possible. All contacts with WRTC-2014 stations will be confirmed by QSL card via the bureau for DX stations or direct to US stations. All contacts will also be confirmed through ARRL's Logbook of The World (LoTW). 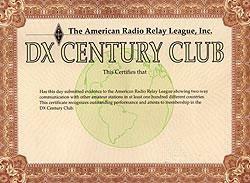 As an added incentive, each contact with a WRTC team counts 5 points for the ARRL Centennial QSO Party. Any station appearing in all 59 WRTC team logs will be able to download a certificate from the WRTC-2014 website after the contest. No additional application is necessary. Scores are expected to be very close among the top teams, so log checking will be a key factor in certifying the order of finish for all teams. The WRTC-2014 Judging Committee needs as many logs as quickly as possible to assist with log-checking. Stations submitting logs within 6 hours of the end of the contest will be designated "Assistant Judge of WRTC-2014." All logs received will be entered into a drawing for one of 25 WRTC-2014 Assistant Judge hats. Every station that submits a log containing confirmed contacts with the WRTC teams on 30 or more band/modes will be eligible for the Bronze level award. These logs will be entered into a drawing to win one of 10 WRTC-2014 bronze medals or one of 50 WRTC-2014 mouse pads. A Silver medal will be awarded to the first five stations from each continent and W1 that confirm contacts with all 59 teams, regardless of mode. Any other stations that work all 59 teams will be entered into a drawing to win one of 25 WRTC-2014 caps. Gold medals recognize the highest level of achievement -- contacting the WRTC teams on the most band/modes. With 59 teams, five bands, and two modes, there are 590 possible band/modes available. Gold medals will be awarded to the top five band/mode leaders in each continent and W1. In the event of a tie, the order will be determined by earliest completion time. Fred Hopengarten, K1VR, operating during one of the WRTC-2014 station tests in 2013. 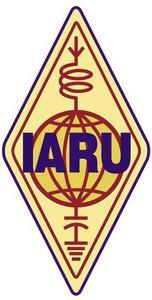 IARU HF Championship must be submitted by e-mail and acknowledged by the robot. Entrants are encouraged to submit logs immediately following the contest. 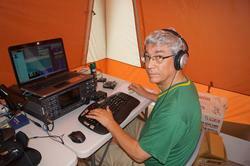 Larry Tyree, N6TR, is managing the WRTC-2014 log-checking process. "We have less than 24 hours to process and cross-check the logs in order to announce the winners at the award ceremony on Monday evening," he said. "Receiving as many logs as possible shortly after the end of the contest will help improve the quality of the log checking." Complete rules for the WRTC-2014 activity award program are available on the WRTC-2014 website. To help determine the best times to work the WRTC teams, Stu Phillips, K6TU, has made his propagation prediction service available for WRTC-2014. Enter your call sign, grid square, and type of antenna system, and the service will provide a table of expected band openings from your location to the WRTC-2014 area. Submit questions about WRTC-2014 and the awards program via e-mail. 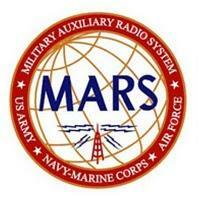 The US House Armed Services Committee has expressed its continued support for the Military Auxiliary Radio System (MARS) program. The endoresement was included in a report accompanying HR 4435, the FY15 National Defense Authorization bill, subsequently approved by the full committee. The House Armed Services Committee also reiterated a series of recommendations it made 2 years ago to strengthen the program. Sponsored by the US Department of Defense, MARS is an organization of Amateur Radio volunteers who provide "contingency communications support" to the Defense Department and to US Government operations. "In addition to providing an important backup to conventional communications that is potentially vulnerable to disruption or degradation, MARS can play a vital role in helping to ensure continuity of government and continuity of operations in the event of a natural or man-made disaster," the committee said. The House panel also expressed concern that the Defense Department was not taking full advantage of the capabilities that MARS provides, and it directed military officials "to integrate MARS more fully into their operational planning and activities." It also called for integrating MARS into the Department of Defense emergency communication plan. The committee noted that actions it recommended in its FY13 National Defense Authorization Act report had not yet taken place. The committee directed the Secretary of Defense to ensure standardization of operating policies and procedures among the three MARS branches -- Army, Air Force, and Navy-Marine Corps -- through the appointment of an individual manager. The committee also directed the Secretary to brief the committee on the status of the Defense Department document, now under revision, that provides policy guidance and outlines departmental responsibilities for MARS. The ARRL Centennial W1AW WAS operations taking place throughout 2014 from each of the 50 states now are in South Dakota (W1AW/0). They will relocate at 0000 UTC on Wednesday, May 21 (the evening of May 20 in US time zones) to New York (W1AW/2) and Colorado (W1AW/0). During 2014 W1AW will be on the air from every state (at least twice) and most US territories. In conjunction with the 100th anniversary of the ARRL, the ARRL Centennial QSO Party kicked off January 1 for a year-long operating event in which participants can accumulate points and win awards. The event is open to all, although only ARRL members and appointees, elected officials, HQ staff and W1AW are worth ARRL Centennial QSO Party points. Working W1AW/x from each state is worth 5 points per mode/contact, even when working the same state during its second week of activity. To earn the "Worked all States with W1AW Award," work W1AW operating portable from all 50 states. (For award credit, participants must work W1AW/1 in Connecticut.) A W1AW WAS certificate and plaque will be available. Sponsors of the FUNcube Project -- a joint initiative of AMSAT-UK and AMSAT-NL (Netherlands) -- have announced that FUNcube 2 will launch from Russia on June 19. The initial plan of the now 4-year-old project was to design, build, and launch a single spacecraft. As further flight opportunities have become available over the past months, however, the FUNcube Project has expanded. UKube-1 will "host" FUNcube-2 -- actually a set of FUNcube boards that will fly as a sub-system of the 3U UKube-1 CubeSat. Its goals are identical to those of FUNcube-1 -- to support science, technology, engineering, and mathematics (STEM) initiatives now underway in the US, the UK, and elsewhere. The target audience is primary and secondary school students. "It is believed that, immediately after deployment and activation, UKube-1 will commence transmitting a CW beacon, and that this will be later followed by an AX25, 1k2 BPSK beacon," AMSAT-UK announced on May 7. "Both beacons will be on 145.840 MHz. The FUNcube-2 payload, with its telemetry downlink for educational outreach, is expected to be tested later." FUNcube-2 will include a 400 mW inverting SSB/CW transponder (435.080-435.060 MHz up/145.930-145.950 MHz down), with a beacon on 145.915 MHz. The UKube-1 satellite, being built by Clyde Space in Glasgow, Scotland, would be the UK Space Agency's first CubeSat, as well as the first satellite built in Scotland. Believed to be not too far down the road, a FUNcube-3 400 mW transponder-only payload on the pre-cursor QB50P1 CubeSat host is planned for launch "no earlier than the second half of June" on a Dnepr LV vehicle from Russia. Initial beacon signals from the main transceiver are expected to be AX25, 1k2 BPSK packets on 145.815 MHz. Read more. IARU member-societies around the world have affirmed the nominations of Timothy S. Ellam, VE6SH/G4HUA, and Ole Garpestad, LA2RR, as IARU President and Vice President, respectively, for 5-year terms that began May 9. With 51 affirmative votes required for adoption, 67 cast ballots to ratify both candidates. Ellam served as IARU Vice President from 2004 until 2009, when he was first elected as IARU President. Garpestad was first elected as IARU Vice President in 2009, when Ellam became President. "I am very honored to have been elected as President of IARU for another term and grateful for the support from the Administrative Council and our member-societies," Ellam commented. "I am excited about the future of the Amateur Radio Services and look forward to working with the IARU team to meet the challenges ahead and to build on the work we have undertaken in the last term." 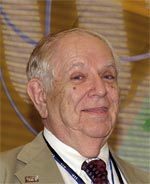 Ellam also congratulated Garpestad and the other IARU officers, including Rod Stafford, W6ROD, who was appointed by the ARRL in its capacity as IARU International Secretariat to continue as Secretary. "I am very pleased to continue working with Ole and Rod as we move towards the next World Radiocommunication Conference in 2015," Ellam said. Garpestad said he also was honored to have been re-elected as Vice President of IARU. "I look forward to the continuing good cooperation with the other officers as well as with the IARU Administrative Council to improve and defend our radio amateur privileges and our allocated spectrum," he remarked. "I am also looking forward to work with all our IARU member societies to ensure a steady flow of new members, especially young people, to our hobby." 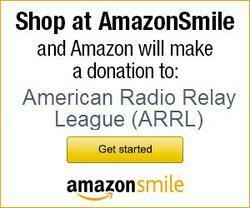 If you already shop on Amazon, or if you're looking for the perfect gift for a family member or friend, we invite you to shop at AmazonSmile and choose American Radio Relay League Inc (ARRL) as your charity of choice. With every purchase you make via AmazonSmile, Amazon will make a contribution to ARRL, which allows us to extend our reach in areas of public service, advocacy, education and membership. We hope you will take the opportunity to support ARRL and Amateur Radio with your eligible purchases on AmazonSmile today! Please note, AmazonSmile is the same Amazon you already know, with the same products, prices and service. Visit AmazonSmile and log into your Amazon account (if you're new to Amazon, you'll need to create one). You may have read about the dispute starting in 1919 and running well into the 1920s, about spark versus CW on the amateur bands. Although CW was easily proven to be better than spark, some real diehard hams held down the spark camp. Before the inevitable changeover, many an ugly insult was hurled back and forth between those two opposing camps. A similar situation developed when single sideband started pushing aside good ol' AM phone, with its double sideband plus carrier. It was a long time before most of the intransigent AMers gave up and went to SSB. Before reaching Amateur Radio, single sideband had been used successfully in commercial transoceanic telephony circuits as early as 1927. But, it proved both difficult and expensive to build transmitting equipment using the components and techniques available at the time. In Amateur Radio, the number of hams prior to World War II was small enough to be accommodated within our frequency allocations, so there was little interest in SSB and its narrower bandwidth; they didn't need it. Advances in radio technology during WW II yielded two important improvements that enabled post-war hams to get on SSB fairly easily and at reasonable cost: Stable VFOs and mechanical filters. A small number of hams started building SSB exciters. Many of them didn't convert their amplifiers from their former Class C function to a linear class of operation, however, so they made merry with 15 or 20 W, showing the AM operators what SSB could do, even with low power. The cover of QST for January 1948 showed an oscilloscope presentation of SSB at work, with the editorial and three articles in that issue introducing "s.s.s.c." (single sideband, suppressed carrier) to the amateur community. And then, the problems started. Most SSB operators tried friendly persuasion on their AM ham brethren, as they demonstrated the advantages of SSB. Many of these discussions became heated, however, often escalating to intentional interference wars. It was not pretty, and it was a downright embarrassment to the ham community. Most phone operators eventually came to realize, however, that SSB was truly better then AM phone, and they migrated to the new communication mode. To this day, though, many AM proponents pride themselves on their excellent on-the-air signals. Some are pursuing nostalgia; others enjoy the engineering challenge of tweaking older gear to obtain the best-sounding full-carrier AM signals. Soon after SSB was introduced to Amateur Radio, transmitter kits became available from manufacturers, notably from Heathkit, which many of us remember fondly. Manufacturers also started offering ready-made SSB transmitters, as well as receivers designed for good SSB reception. 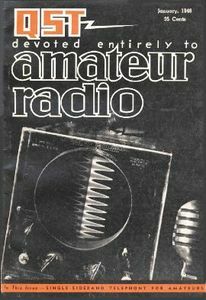 Throughout this changeover period, the ARRL, via many articles in QST, encouraged hams to use SSB. Radio Amateurs in Vietnam Get New Frequencies: According to the Vietnamese Amateur Radio Club, Amateur Radio operators there now can operate between 7100 and 7200 kHz (in addition to 7000 to 7100 kHz), 10,100 to 10,150 kHz, 3500 to 3900 kHz, and 1800 to 2000 kHz. Also, a new band has been allocated at 472 to 479 kHz. Tad Cook, K7RA, in Seattle, reports: After the uptick mentioned in last week's bulletin, we saw more nice numbers this week, with average daily sunspot numbers rising from 118.4 during May 1-7 to 142.4 during the reporting week, May 8-14. Average daily solar flux rose from 135.6 to 157.5. The latest prediction from USAF/NOAA has solar flux values of 165 for May 15-16, 160 on May 17, 155 for May 18-19, 150 for May 20-21, 140 on May 22, 120 for May 23-26, 115 for May 27-29, 120 and 125 for May 30-31, 135 for June 1-2, 140 and 145 for June 3-4, and 150 for June 5-9. 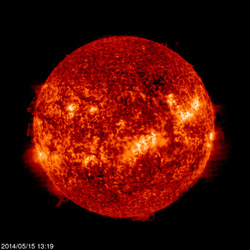 The solar flux will peak at 165 for June 10-11, and drop to a minimum of 115 for June 23-25. The predicted solar flux of 165 for May 15-16 is the highest predicted value until June 10-11. The latest planetary A index predictions are 10 and 8 for May 15-16, 5 for May 17-21, 8 on May 22, 5 for May 23-June 3, 8 for June 4-6, 10 and 8 for June 7-8, then 5, 10 and 8 for June 9-11. ARRL Field Day is now about 6 weeks away, so those dates (June 28-29) are moving into the USAF/NOAA 45-day forecast window. Although this is a long way out, we see solar flux rising from 115 for June 23-25, to 120 on June 26, 125 on June 27, and 135 on June 28. Planetary A index is predicted at a nice stable level of 5 from June 19 forward. In tomorrow's bulletin look for an updated forecast, solar news, predicted June 29 solar flux, and reports from readers.